During the workshop we will set up an experimental lab for tinkering and sewing. Fender will introduce to you how to build sounding electronic circuits, and you can explore sound technology from scratch. The workshop takes you on a trip through sound-producing electronic engineering projects. For example making microphones, amplifiers and basic synthesizers. 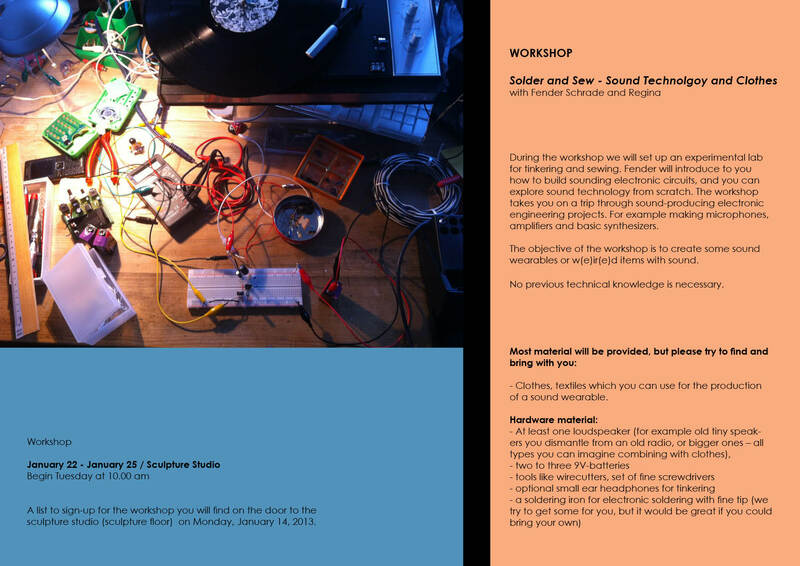 The objective of the workshop is to create some sound wearables or w(e)ir(e)d items with sound. No previous technical knowledge is necessary. Clothes, textiles which you can use for the production of a sound wearable. Due to technical reasons the workshop is limited to six participants. But if you want you can also collaborate with somebody on one piece / using one workplace out of the six. A list to sign-up for the workshop you’ll find on the door to the sculpture studio / sculpture floor.